With a long time off the water a call was made that a storm was building over Iceland and sending strong winds to the UK. As the weekend drew closer the forecast was still there, a summer of promises a week away never appearing and this was good news. Many windsurfers hit the water at my local spot, the winds built over the day and the kites cleared off leaving lots of space for the bravest.....and by that point, fittest! Monday was the day for West Kirby, again a workday for me and not in the holidays. Lots of the UK speeders arrived for the promise of good winds in the (near) perfect direction. Here are a few words from some of the best in the country, and I am sure they have proven now that they are also some of the best in the World! Ian Richards wrote this with his post on GPS Speedsurfing. Kirby was buzzing today, conditions looked excellent at times but you really had to pick your moment for that fast run, it needed more wind for a record 5 x average day but at least myself and Andy Holland smashed the same gust and both scored a massive PB. Problem was we could'nt do it again or get anywhere near it ,but I'm not complaining. Had a 50.29 knot 1sec on the screen, never thought I would see that on British Waters. What is remarkable is Ian has proven that it certainly is not about the latest kit, he did this on an NP sail with a Fanatic Falcon both from 2006. Old speed boards like this go for relatively little money on Ebay, so anyone who windsurfs a lot can fit one in their quiver and have a go on the speed scene. Jim Crossley also scored a great session, putting himself in the top 10 for the year along with Ian. Jim is really showing consistency in every speed session now, each time West Kirby, The Ray or even Portland Harbour fires up he is always posting scores at the top end of the scale. Started off at 8.30am with the JP and a gusty, super broad wind making it hard to get above 43kt peaks. I was using all my kit for the first time today and it kept getting faster. I hooked one big gust that gave me the peak speed and it felt like there was more there for sure. Evo 5 was rock solid as was the fin. I feel ready! If I have one complaint on the day its Ian - I thought I have finally beaten the bugger but no - one hour later after I saw him jumping up and down with a PB. Maybe another time :-) congrats though Ian. Great to see everyone enjoying themselves with quite a lot of PBs I think - an awesome day! Good luck in Luderitz Will. When the rest of the scores are analysed it could be assumed that the three guys mentioned above caught a good gust for their peaks as all the peaks below are a lot more consistent with the 10 second runs which really shows the high standard of sailing they achieved. Jim and Neil Hardwick scored a couple of amazing 500m runs, which I believe are difficult due to the length of the run and the size of the chop at the end of it (hopefully I will find out soon). 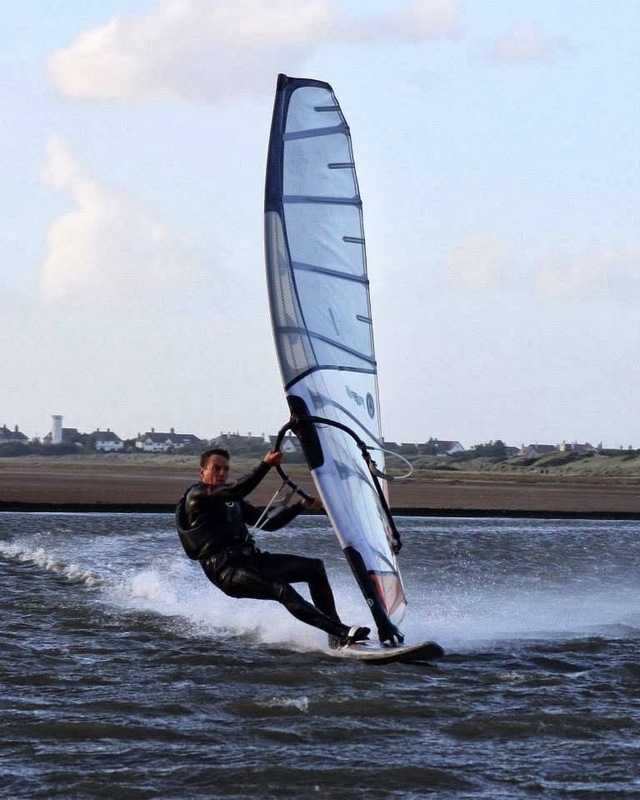 My 1st posting and speed session at West Kirby. Learn a lot over the two days and can now retire as I hit 40 knot peak on the 2nd day. Very happy with this result and may have another go as i have got the bug! Finally I would like to mention a little about Matthew York, a very dedicated speed sailor whom has invested a lot of time and money to chase his personal bests. He smashed them on his new Point 7 AC1 sails with an average of 41.45 and 2 sec peak of 43.78, well done Matt you deserve it. Well done to all who sailed there, sorry if I have not mentioned your name this time round. This article is for Ian and his amazing 50knot achievement on British waters which has only been shown by two others in the past. I do hope Pete Young can get up there again soon to get the big 50. All results can be seen here on the GPS Speedsurfing site.